So typical that again JC gets currancy like this. was hoping there wouldnt be this time around but no. most proffs you can get everything in a few days but JC again need to farm dailies for months. Illustrious Jewelcrafter's Token's are received as a reward from the Jewelcrafting dailies at each of the factions capital cities. For the Alliance you talk to Isabel Jones Located in Stormwind and for Horde it's Marith Lazuria located in Orgrimmar. As Gant stated above, you are not eligible for the dalies until you reach 475 in Jewelcrafting. It IS also one of the two professions that produces something, that everyone will always need, and the only profession that everyone will need a lot of. So it does seem just a little bit fair, that we can't just spam all the designs at once as the money making machine JC is. There is some truth to this but there is also something else to consider, its also a profession where only the newest and best stuff is always wanted, all the old gems are just vendor value. Further once everyone figures out whats stats are best to get only a handfull of the cuts will even be used and there will be alot of competition for selling those. For example i used to offer free cuts for anyone for any cut they wanted, i kept a sock of tokens so i could purchase whatever pattern they wanted, i did this for almost a full year, these were also the only paterns i ever purchased. By the end of lich king I had purchased less that 25% of the potential gem cuts. even now with the new gems and inflated prices there are some cuts where even perfect versions sell for less than mat cost (especially green ones). This varies per server ofcourse but will likely follow the same patern on most. And because these are the ones everyone wants the gems associated with them will be sold less often and thus be more expensive, further eating into profit if you dont collect your own mats, and since there is no consistant way of getting a particular gem its dificult to do this, I always seemed to be out of dark jades in lich king for example, not cause i made alot of them but because i never seemed to get them from my prospecting. Which is not to say that JC isnt a profitable profession and worthwhile, but ultimatly it is one of the most random professions and can backfire on you big time. Just look at the fire prism, requires 3 of every gem and you have no idea if the output will be worth it. I remember so many icy prism uses that left me with nothing but a rare green and blue gem which wasnt even worth AHing. Or prospecting 4 stacks of saronite and still not getting that dark jade i needed for my daily. So in conclusion the frustration I feel from this style of token usage is that you combine a slow rate of learning paterns with an inconsistent method of obtaining gems and it just feels clunky. You may know you want to sell that red +40 agil gem so you buy the patern, but good luck obtaining them on your own. and i do mean luck. I see that there are five quests that can be completed for the tokens. So is there five dailies that can be done a day or is there maybe three dailies with the five random quests? Made to slow down leveling. Blizzard wanted to be sure that before you will be able to buy this recipe it'll be already yellow to you so it'll have lower chance of granting skill point. Yeah except that.... there is absolutely nothing random about it. It's like saying that if you're playing texas holdem and flop a 4-flush draw, whether or not you hit is random. It's not random... you will hit that flush a little better than 1 in 3 times. Same with prospecting. If you prospect so many times, you WILL get a given number of all the gems possible. Any other outcome is mathematically impossible, and therefore not random. The wotlk tokens could also be purchased with titanium powders if I remember correctly. (10 Titanium powder = 1 token, I think) Is there a powder that can be traded in for these tokens? Edit: why downrate? Simply asking a question. Everyone is mad. All of the daily quests are obvious Futurama references. It makes these monotonous quests that I'll be doing every day slightly more bearable. Does anyone know if they'll be adding in objects to turn in for tokens, like they did for wrath? if your spending gold on nightstones your an idiot, your a JC for christ's sake, pick up mining and prospect the ore, you get heaps of gems and anything left over you wont use later on you can sell for a ! @#$e load and be rich....use your noggin (fogger elixer*) .... ZING! All are talking about new epic cuts, there wont be any new epic cuts,the reason is simple, all professions are made to give equal bonuses. For JC u get to put 3 JC gems, which gives a bonus equal to 2 rare gems. For BS u get 2 sockets = another 2 rare gems. For Mining u get 120 stamina = 2 rare gems. For Skinning u get 80 crit rating = 2 rare gems again..
His logic is more fail considering they dealt with this exact issue by making all other profession bonuses higher when they released the epic gems in Wrath. He proved himself as a nub. Is there a limit to how many of these you can have stockpiled? but the 240 haste for 20 seconds every 2 minutes, off the GCD makes for a rather fancy trinket booster. Is there a way to use ..GetItemCount(" ").. with this currency? I am trying to use it so I have a macro that tells how many I have in my currency tab, since this is not a physical item. However, this function doesn't seem to co-operate with my bag addon "OneBag3"
By Onijin: Technically speaking, if either of the premises or the conclusion is false, then the argument is invalid, and therefore, illogical. The sentence as you are quoting it is correct but... technically speaking, no one talked about arguments, you did. Mvdonkey simply said "your logic is fail". Saying that other professions bonuses are roughly equal to 2 rare gems cut isn't illogical. You can say "yeah, but saying that because of that there won't be any gem cuts is wrong, therefore his argument is wrong, bla bla.." but as i said.. no one talked about arguments. Tailoring benefits from special cloak enchants that proc (i don't know the mats, but i guess blizz balanced it somehow). Herbalism healing is practically nonexistent now (roughly 1k instant not hot), and its haste effect (as tailoring's one) is a temporary buff, not a static stat. Actually, the only way something is invalid is if there exists a case in which all of the premises are true and the conclusion is false. As of 4.3, 66 epic JC patterns have been added at a cost of five tokens each, or we can learn a random pattern for four tokens using Tome of Burning Jewels. To buy all the epic patterns, this requires 330 tokens to buy each pattern specifically or 264 tokens to buy them all through the tome. We now need 611 or 545 tokens for all the purchasable Cata JC patterns. So you need 281 tokens to purchase all the patterns from the vendor. A shame that there's no reference to anyone but Leela and Nibbler. If there were quests related to the Professor or Bender we could have plenty of random fun. At the moment, you can only get one per day. Have fun. reaching 130 now, what are people's opinions regarding the release of epic gems will all our tokens be converted to gold? or there maybe a different token then? To get all of sick cata JC reciepes,you`ll need to complete exactly 281 daily in a row(each day) ! As i believe,they made this,for poeple,who wanna get some money from AH,if i need 281 day to get all gem cuts + trinks,i wont buy some str + stam as a mage,because i`ll better get some hit+haste(just incase).So market for JC is splited for "clases" partly.From one side it`s a good idea,but form other,this is my proffesion & i can`t get all reciepes to sell items for golds - seems abit wrong.... I`m not talking about some drop epic reciepes ! So far the recipes are learned from Tome of Burning Jewels. I am still praying that those are purchased from JC tokens and are not drops off bosses in the new 5man dungeons or raids. 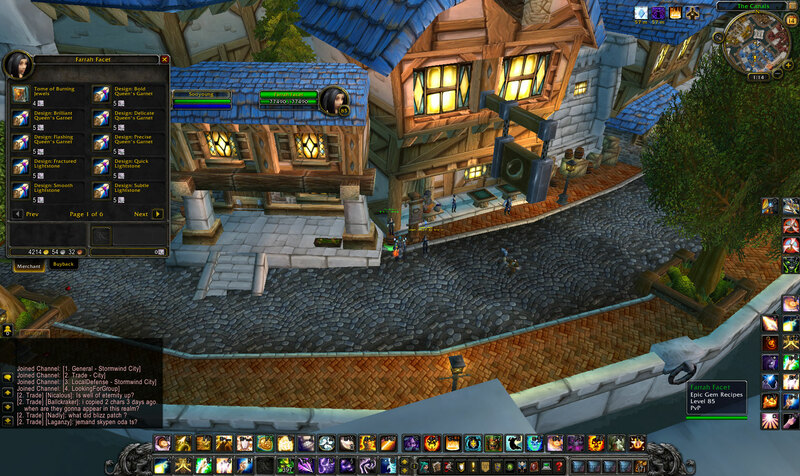 With the latest 4.3 build (14849), vendors have been added in Orgrimmar and Stormwind. Each epic gem recipe costs 5 tokens and the Tome of Burning Jewels can be purchased for 4 tokens. Thanks to Migari from the MMO-Champion forums for the image. EVERYBODY! YOU WILL NEED THESE TOKENS FOR THE NEW EPIC GEM RECIPE'S FOR 4.3! You get these from the Jewelcrafting daily. 1 quest per day ! You get 1 a day, 7 days in a week. In total, you can buy two recipes a week, 3 every 3 weeks. Does anyone still spend any time making older gems, like wrath or bc? I am noticing there a somewhat of a market for this. I think it's about time they added a way to get these without doing the daily. If they put them at the vendor for 4k justice points each that would increase 5 man activity and allow us to get the patterns faster. Considering how fast you can level your char and gear it up at lvl. 85 it is just unbelievably silly (and stupid) to only get 1 token per day. Even getting recipes for jewel crafter and only 1 alt (which are sharing primary attribute!) can get really tedious with this extremely slow pacing acquisition of profession tokens. You are actually forced to grind for at least 15 days + consecutively to get the recipe cuts for main and off- spec even when chars are sharing attributes. When you consider that Blizzard is now even encouraging playing with more than 1 char it would be wise to remove the burden of everyday jewelcrafing token farming. Anyone noticing that we don't seem to be able to continue grabbing the daily for the Illustrious JC tokens? Looked on launch day and 2nd day after launch of MoP and still no daily quest in Org. Is this being taken out? And there's no equivalent of Titanium Powder hand-ins either. Dailies for almost two years! Makes MoP dailies seem reasonable! been doing the dailies and farming the ghost iron ore, now for some reason i can't prspect the lower gems for the dalies, any clues? Might as well do at least three (3) dailies to get a recipe if you are just leveling up Joalheria post-cataclysm. I got really stuck around 495, where only Anel de Hessonita and Gargantilha de Noctilita gave skill-ups. This, in turn, made Hessonita and Noctilita hard to come by. I even made O Perfurador because of the dearth of Hessonita and Noctilita! So unless one plans ahead and saves all the Hessonita and Noctilita they come across, leveling to the end of 500 skill in jc can be a bit of a bottleneck without one of the daily-token rewarded recipes. Are there any patterns these can buy that would be considered good to have for any reason? I have six of the tokens, so I figure I may as well use them, but if any of the patterns are actually relevant anymore...I can't tell. Heck this takes a real long time to grind. If you are trying to get all the patterns, you'll need a lot of Jasper, Zephyrite and Nightstone. You can get them by prospecting, but that will only give you gems you need for the dailies less than half the time. I've found Giant Sack to be a good source for ONLY Jasper, Zephyrite and Nightstone. The sack drops from 2 mini bosses in Zul Gurub, both located near the venom boss. It will allways yield some Elementium Ore and 2 of the gems you need for the Cata JC dailies. The mini bosses are soloable by any class. They do a fair amount of damage, but only have 1.6 million health. What's even better is that you can farm two mounts while you're at it. It's also very easy to get to Zul Gurub by taking a portal to any home city, then taking the portal there to the Blasted Lands. From there it's a very short flight to Zul Gurub. As stated by Delaios, the Saco Gigante that is dropped in Zul'Gurub by Kaulema, o Transportador and Mor'Lek, o Demolidor, contains Elementium Ore and two of the gems needed for the Cataclysm Jewelcrafting daily. You can get 20 of these per one hour instance lockout by killing both enemies that drop them and then running out of the instance and resetting it. As long as you don't kill any real bosses, they will keep respawning and dropping the bags. 3 expansions later, still takes months to farm it all, I bet it is "working as intended"
It appears this has changed/is bugged as of 7.0.3: the only quest I received 27 times in a row is Nibbler! Não!. To get the quest you need Cataclysm Jewelcrafting 25. Based on grasshopper51003 's post it prompted me to create a blizzard official forum thread about this. You can only attain 1 Illustrious jewelcrafter's token per day through 1 daily quest in stormwind/orgrimmar. Considering you would need 611 or 545 tokens (days) for all the purchasable Cata JC patterns the grind seems a little extreme for collectors at this point in 2019 with only one single daily quest and the item/stat squishing they have done rendering most old gems obsolete. Any comments or up votes to get it noticed and some traction would be greatly appreciated and benefit all of the JC's who are collectors. I lay out several ideas of my own for changes but feel free to add any of your own in the comments as well. Concedidas a quem demonstra grande habilidade em joalheria, essas fichas podem ser usadas para comprar instruções de joalheria raras e olhos-da-quimera fabulosos.